Since graduating from the University of Queensland in 1986, Murray has spent the majority of his career in Melbourne. He has been the owner of the Middle Brighton Veterinary Centre since 1991 and along with his wife, Anna, has built it into the busy, well respected clinic we see today. The clinic is based on excellence in patient care and customer service. Murray is our Surgical expert, having completed a Masters of Veterinary Studies in Small Animal Surgery at the University of Melbourne shortly after graduating. He also has a soft spot for Rabbits, and along with the other team members, the Middle Brighton Veterinary Centre has developed a reputation as a ‘Rabbit Friendly’ Clinic. Murray is currently expanding his vast surgical repertoire to include laparoscopic abdominal surgery – also known as ‘key hole surgery’ – which is at the cutting edge of Veterinary Surgery and will have a profound impact on patient’s recovery. This equates to getting back to the park & beach sooner! In his spare time Murray enjoys motorbike riding & a glass of a good wine with some French cheese! Anna graduated Dux of her year in 1989 from Melbourne University and began her career there as a Medical and Surgical Intern in Dogs and Cats. 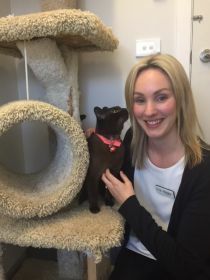 After completing her Masters of Veterinary Studies she worked as an Emergency Vet in Melbourne before travelling to England for some fun and more experience. In 1996 she joined Murray at the Middle Brighton Veterinary Centre. Anna’s interests lie in medicine and animal behaviour and runs the Clinic’s Puppy Preschool Program. 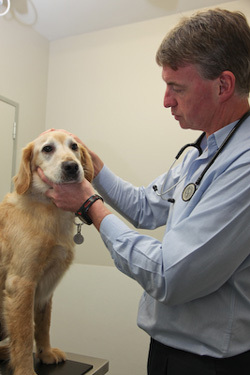 She is a compassionate vet & dedicated to the health and welfare of all the patients in the practice. Growing up Anna always wanted to be a vet and has never been without a pet in her life. Married life if busy for Murray and Anna – they have two daughters, Madeline and Olivia. Then there is Gina, their very cute and talented Border Terrier dog & Gina’s son, Tonic – who use to be a regular at Puppy Preschool – now she spends her Tuesday evenings curled up in her bed! They also have a third dog, Bella the very happy Pomeranian. Then there are their two cats – Truffles – a white cat – that is rarely every white and Cali – a very independent Tabby! When not looking after her family and pets, Anna enjoys reading, sewing and walking Gina,Tonic & Bella. Her recent goals have been achieved – her motorbike licence & completing an intensive course in Diagnositic Ultrasound in Dogs and Cats by Distance Education. Her goal for 2019 – as always, is to fine tune the work life balance! Dr Kirsty has been a vital member of our Vet Team since 2015. Kirsty is an experienced, caring Veterinarian working full time – she is either in consults or doing surgery each week day, except Tuesdays. Kirsty graduated from Melbourne University in 2002. Since then she has continued updating her knowledge by completing distance education courses and in 2013 she became a member of the Australian and New Zealand College of Veterinary Scientists in the field of small animal internal medicine. Kirsty shares her home with a cat, a dog and her partner and young baby. Pickles is a black 3 year old domestic shorthair cat who is infatuated with Koopa the 9 year old black Labrador. It is very difficult to get a great photo of them curled up together – they are just a mass of black fur! Kirsty is back with us on a part time basis working Wednesdays, Thursday along with shared weekend duties, after having her baby, Emily. Laura is a great member of our team and is studying to become a Qualified Vet Nurse. 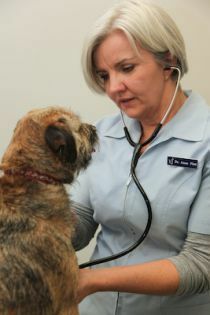 She is vital part of Middle Brighton Vet, ensuring the smooth running of our clinic. She lives locally, sharing her house with her naughty but nice cat, Heidi! Laura is pictured here with Heidi who was having a relaxing time in our cattery. Janelle is our NZ vet nurse having trained in the North island, with experience in rural clinics. She has a bright and bubbly attitude and a has always had a passion for animals. In her spare time Janelle enjoys hanging out with her Tibetan Spaniel, Obi, named after Obi Wna Kenobi from Star Wars. 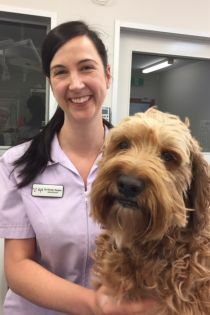 Steph is a great addition to our nursing team having recently completed her Certificate IV in Veterinary Nursing through the Kangan Institute. 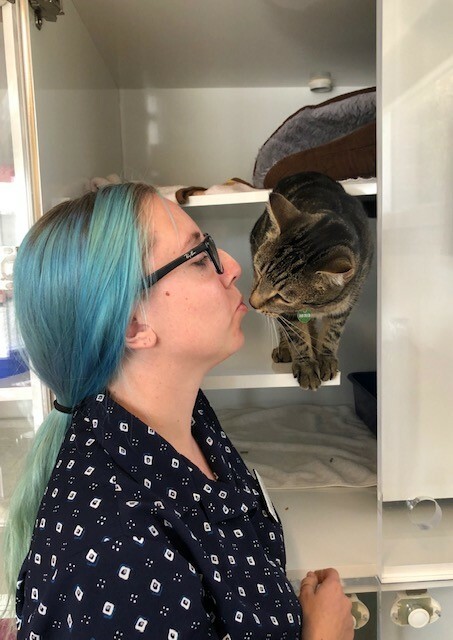 Pictured here receiving a very special kiss from the very special Andy who frequently holidays in our cattery! Briony is a new addition to our nursing team and is currently studying for her Certificate IV in Veterinary Nursing at Box Hill Tafe. She is, like the rest of us a lover of cats having 5 wonderful cats to share her life! Jane always dreamed of working with animals from a young age and we welcomed to our team early in 2018. She is currently studying to become a fully qualified vet nurse and is working with us at the clinic part time. She enjoys all aspects of veterinary nursing especially giving cuddles to animals who need comfort. Jane grew up in country Victoria and now lives with her family including three kids, two furry cavalier kids, four beautiful budgies and many fabulous fish. Jane is pictured here with the very gorgeous Moose, who is a regular in our Cattery! Anna first came to the MBVC when she commenced her Duke of Ed Certificate way back in 2015. 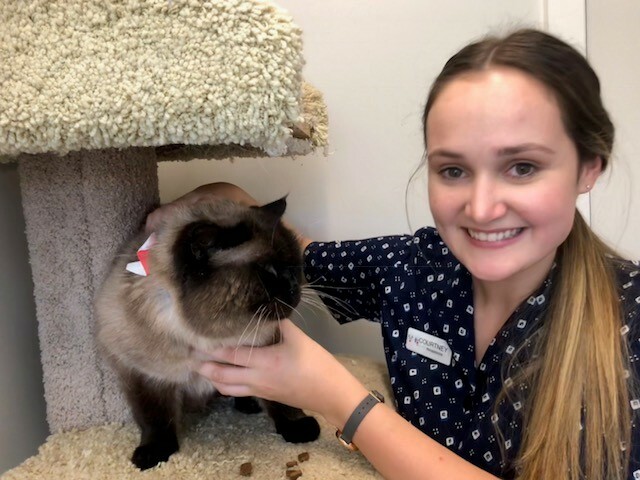 After she finished Year 12 and commenced her Science Degree at Melbourne Uni Anna returned to us working on the weekend in the Hospital and Cattery. 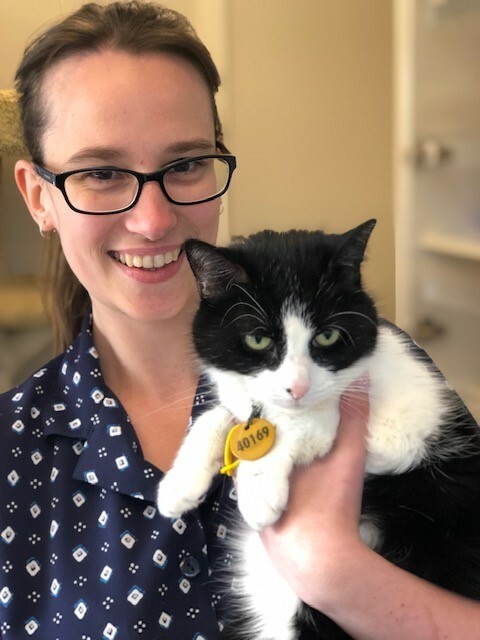 In 2019 Anna was accepted into Vet Science at Melbourne University – we all know she’ll make a great vet! Georgina is our star Receptionist! She has many years front of house experience and we are all delighted that she is the friendly face at reception or on the other end of the phone – Georgina will make you and your pet feel at ease. She has always been surrounded by animals and has a particular love for dogs – especially her own two Molly and Toby. Courtney completes our Reception team! Courtney is a great member of the Middle Brighton Vet. She has such a kind and friendly nature and always has a smile on her face. She strives to make you feel welcome and at ease and is very quick to greet your furry friend with a tasty treat! She is pictured here with the very gorgeous cat, Polo.